You just want to get the shopping done when there it is – that perfectly placed toy, right at your little one’s eye level. He wants it. Right now. You say no. Next thing you know there’s a screaming, flailing kiddo on the floor. Download a PDF refrigerator guide of this article here. You ask your pre-teen how her day went. “I hate you!” followed by a tirade of all your faults. …they can be the best thing that ever happened to you and your child. Imagine you’re having a rough day and you call your best friend on the phone. You really just want to blow off some steam but you’re not sure how to communicate this. Your friend launches into a description of her day. You try to listen but inside the tension keeps building. You find an excuse to get off the phone, then you start nagging your kids to clean up the mess they’ve made. You feel like you’re going to blow. Or, let’s shift that scenario. You let your friend know that you really need a listening ear right now. You get your troubles off your chest while your friend offers an occasional “hmmm.” You feel lighter and more connected to your friend for the gift of listening she’s given you. You end the conversation and take a few minutes to connect with your kids. The thing that was bothering you hasn’t changed, but you feel better able to handle it now. The difference – you felt heard. And, that simple experience of feeling heard, shifted you reactive to responsive. When your child expresses big emotions or uncomfortable feelings, he’s letting you know that his thinking brain has gone off-line. He has shifted from feeling safe to a state of reactivity. I like to call an off-line brain a “safety brain.” It’s the part of our brain that shuts down all unnecessary functions – like rational thought, empathy, impulse control – and mobilizes the body to take action. Sometimes that’s using a loud, scary voice or words; other times it can look like kicking and hitting. No matter the behavior you can be certain of this – when your child’s safety brain has taken over, no amount of threatened consequences, bribes, convincing, etc will make any difference. What a child in safety brain needs, more than anything, is a caregiver who is capable of keeping her own brain “on-line,” even when things are hard. Because you see, the ability to turn on a calm brain is gained through repetitive exposure to feeling your brain shift from safety to calm. One of the primary jobs of childhood is to cultivate a sense of resilience – that is, an underlying sense that one can experience discomfort without becoming overwhelmed by it. Resilience is what allows us to recognize when our safety brain has turned on and to make a choice as to whether or not it’s needed. This is an on-line brain, a calm brain. A child learns resilience through her experiences. The experience of having big and uncomfortable energy in her body; the experience of that being validated through a witnessing caregiver; and the experience of being held in a calm space while the energy moves to completion and is then made sense of, together with her caregiver. A child learns resilience by watching his caregiver experience her own uncomfortable feelings. He’s watching carefully how she is able to express herself through the process and to respond with actions that make sense, that maintain an overall sense of safety, calm, and kindness. This includes when the source of discomfort is the child’s behavior. A child learns resilience by repeatedly experiencing that it’s ok to both feel and express uncomfortable feelings without becoming overwhelmed, without hurting herself or someone else, without fearing punishment. A resilient child is a child who, at her core, has felt listened to, heard. Your Child is Having a Meltdown. Now, what? 1. Pause: This may be the hardest and most crucial step. Slow down your impulse to react and to stop the tantrum. 2. Anchor: Slow your breathing, lower your gaze, soften your heart and body. Release any anxiety about the meltdown with a large and extra long, whooshing exhale. Connect to the truth that this tantrum isn’t about what’s happening right now. Rather, an underlying need or hurt has been triggered and your child is simply moving this emotional energy through and out of her body. Keep breathing and stay present. 3. Get curious: Think, “respond, not react.” Move to the same level as your child – usually, down low. Your primary goals are to keep the connection open, to maintain safety, and to listen. When it makes sense, offer gentle touch or encouraging sounds. If a child is having trouble maintaining safe boundaries it’s ok to say, “I will not let you hit me,” in a firm but gentle voice. Remove items that are being thrown. Remember that your impulse may be to talk your child out of her tantrum, to bring up grievances, to use threats or bribes; instead use your own sense of calm and understanding of emotional energy as a tool for staying connected. 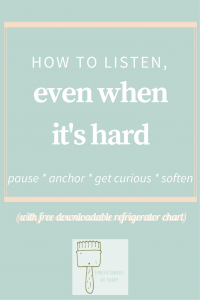 For more ideas on how to stay connected during a tantrum check out this excellent article – What to Say During Stay Listening, by Hand in Hand Parenting. 4. Soften: Any time you notice yourself tensing, wanting to make things better, and/or escaping the tantrum, simply come back to your breath. Take long, deep breaths to keep your calm brain turned on. Breathe into any part of your body that feels tight. Look for cues that your child’s calm brain is coming back on-line, that the emotional energy has run its course. This may look and feel like a shift in energy; your child’s words are making more sense; she’s making more eye contact; her posture is more relaxed and organized (e.g. she sits up if she was rolling on the floor, or sits down if she was standing); and she may seek out more physical contact with you. Again, your impulse may be to problem-solve, bring up grievances or set boundaries. Instead, practice maintaining a soft body and heart. Notice whether or not the impulse still remains. If it does, take note and know that you will follow up with that at a later time. 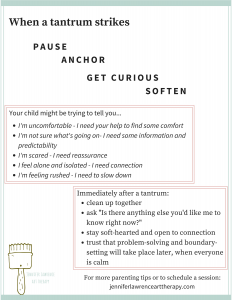 Soften some more and focus on connecting with your child. This is a practice that will evolve over time. One way to deepen your practice is to make sure you have your own support. The only way you will be able to allow your child to move through his emotions, no matter how big or uncomfortable is if you get comfortable with your own emotions. Having someone who listens to you, in a calm way without judgment is absolutely essential. This could include your partner, friends, or even a therapist. As you start to practice with your own emotions you’ll quickly get a good sense of who would be a good person to explore this practice with. Hint – it’ll be someone who is also committed to his or her own personal growth. I hope you’re starting to get that a tantrum isn’t about your child seeking a solution, other than to re-establish a feeling of safety. That being said, there is a time and place for problem-solving and setting boundaries. Some families accomplish this through family meetings, one-on-one problem-solving dates with their child, or working with a therapist to gain outside perspective. Here’s the thing – allowing your child to build his resilience for tolerating discomfort in a safe, respectful and nonjudgmental manner is important work. It clearly communicates unconditional love and respect. And a child who feels respected will then contribute to and be invested in your family’s mission. 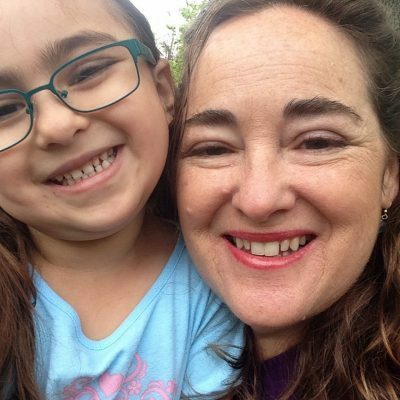 This will be a child who, rather than being on the edge of discomfort and overwhelm all of the time, will be able to have a discussion about areas that need improvement. He will be able to communicate his needs and advocate for those being met. After some time of using your listening super powers, don’t be surprised if you see the quality of your child’s tantrums shift. They may become less frequent, or less destructive. And, don’t be surprised if parenting becomes fun again. Get your free refrigerator guide of this article here. Parenting is hard - especially when your child is struggling. Art therapy is an amazing tool for finding creative solutions, building resilience, and fostering communication. It is accessible to all ages and all abilities and processing styles. Let me introduce you and your child to a world of color, creativity, and clarity. In-person counseling for families in Central New Jersey. Subscribe for updates on future workshops, resources, and articles.